From the middle of May next month when ‘One Planet’ Cities is launched, a campaign will start to persuade cities, towns and communities to declare #oneplanet status that allows them to plan & track a path into the safe and just space defined by the work of Kate Raworth and others. The framework proposed is a way for any town and city to actually do something measurably meaningful once they have declared a #ClimateEmergency in line with #ExtinctionRebellion‘s international campaign. Cities will work out how to #MoveTheDate of their Earth Overshoot Day to become more and more sustainable over time using a framework like this. I am beginning in my own area with #OnePlanetSwansea, #OnePlanetCarmarthen and #OnePlanetLlandeilo. A group I’m part of is also trying to acquire land to build a new ‘one planet’ neighbourhood on the edge of my town using a community land trust. For #OnePlanetCarmarthen there is a launch in the University of Wales Trinity St David Carmarthen campus, 22nd May from 2pm, room TL05. #OnePlanetLlandeilo May 23rd 7pm in The Dragon’s Garden. #OnePlanetCardiff arrangements are being made. Any community may start this on their own, and I can provide support. 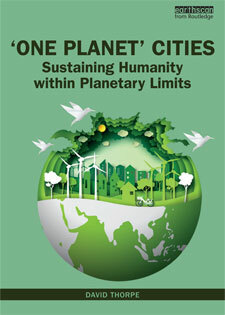 The idea of a one planet community is that each community would set a target of reducing their overall impacts, broken down into sectors – such as buildings, food, energy, transport – and of improving the region’s biocapacity, to reduce their ecological footprint from the current unsustainable three (in the UK) to one planets within a generation, in line with the Welsh Well-Being of Future Generations Act’s requirements. Each community would do it their own way, setting targets over five year intervals, as suggested in the WBFGA. Everybody needs to be involved to some extent, even if it’s just vaguely knowing about it! I am also starting to teach a PG Cert in One Planet Governance at UWTSD from September, based on this, in which I want to train the next generation of leaders in these ideas; getting out of the silos, thinking holistically, measuring what we do, encompassing the whole economy, to deliver genuine sustainability within the safe and just space. It will be delivered online. To get involved or find out more, contact us.